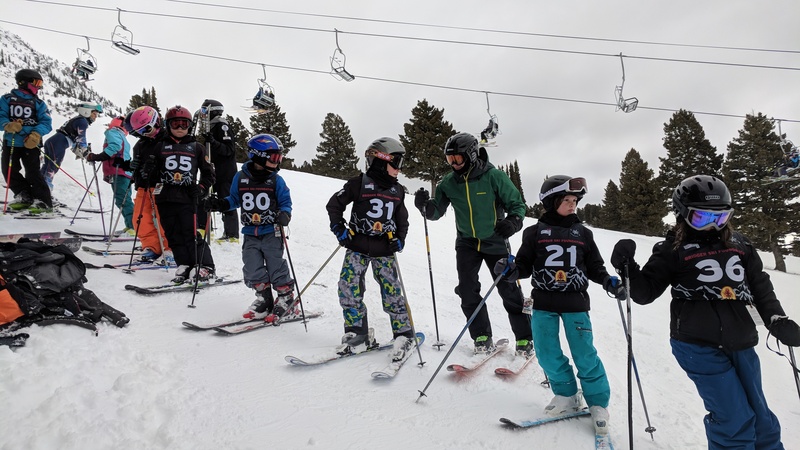 The U10-U12 Introductory Development (aka Intro Devo) Program is for the young skier ready to move up from the Intro programs. Typically this is U10 & U12 ages, but some U8 skiers join us as well. We maintain a balance between having fun, building a positive team environment, and advancing our skiing. We want you to love skiing as much as we do. Intro is for intermediate skiers looking to develop their fundamentals while exploring Alpine racing and/or Freestyle. Intro Devo is the next step, which reinforces fundamentals while giving the athlete the tools to be an entry-level Alpine racer. *U8's may also join Intro Devo on a case-by-base basis. Skiers move up to the Introductory Development (aka Intro Devo) program as they develop their skills. We start to emphasize race techniques by skiing difficult terrain and conditions and working on drills in and out of gates. At the U12 level, athletes can participate in fall training to build conditioning and work on injury prevention through outdoor games and exercises. Note: *We typically recommend fall training starting at age 10, as part of the U12 Intro Devo. For parents with younger athletes (8-9 years of age) who want to train in the fall, please contact the program director to discuss options. 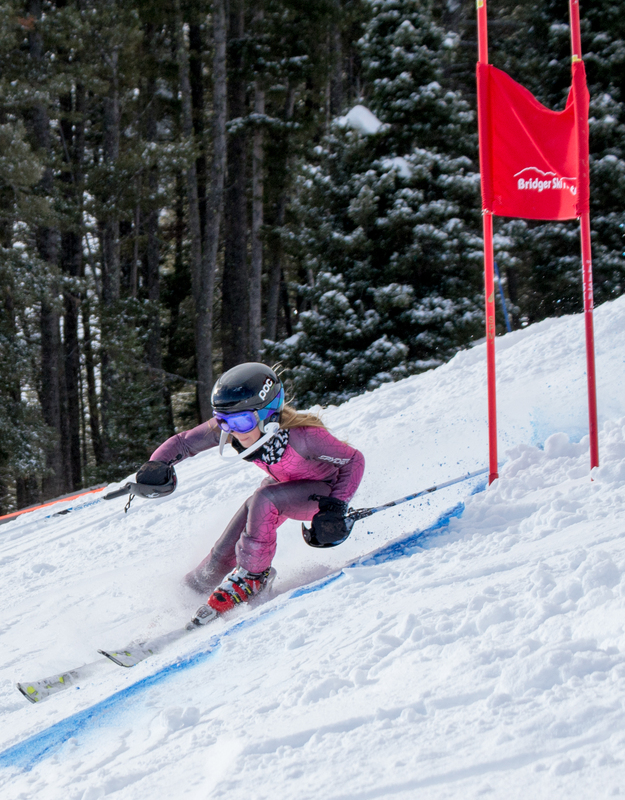 U10/U12 Intro Devo skiers have the opportunity to compete in U.S. Ski & Snowboard (formerly USSA) Northern Division races held at Bridger Bowl and other ski areas located across Montana. Coaches will help each skier determine appropriate races and the degree of travel. Neither is required. As a member of the U10 & U12 Team, you're now part of BSF's Junior programs. This means you're eligible to apply for need- and merit-based scholarships. Learn more HERE. Skis - At the U10 age, one pair of skis is sufficient. U12's may start experimenting with discipline specific skis with the help of coach discretion. The rule of thumb is to size the skis to "head height." There can be some variation based on weight and skiing skills. Chin to nose for a newer, less aggressive skier. This also applies to Slalom skis for older athletes. Nose to forehead for a more accomplished skier (GS skis for older athletes). U10/12 athletes can benefit from an introduction to ski preparation/tuning but will need the help of a parent or coach for a while yet. Boots - Proper fit with soft and even forward flex. This will allow for ankle movement facilitating a balanced athletic stance. Please don't size boots too big with the hopes of getting multiple seasons out of one pair of boots. At this age, athletes will most likely need boots every year and we can help cut costs with hand-me-downs and deals at the BSF Ski Swap in November. Protection - Helmets are required. Hard Shell (no soft eared) CE approved or equivalent helmet required. Older athletes (typically U12 and up) will start using shin and arm protection. BSF coaches can help determine when an athlete needs additional protection based on training/racing needs. Poles - The Standard "rule of thumb" for poles is to have the forearm parallel with the snow with the tip of the pole in the snow. This should be done with the athlete standing in his/her skis. U12 athletes may start using slalom poles that can be slightly shorter and may need pole guards for slalom protection. Again, coaches will help determine when athletes should be using what equipment. The Ski Swap, held each November at the Fairgrounds. Thousands of items. (It’s also one of BSF’s biggest fundraisers.) BSF members get in an hour early. If you volunteer at the event, you get in even earlier. The U10 athlete may range in ages 6-9 years old. These young athletes are in the "foundation" stages of the sport of skiing/ski racing and will ski approximately 2 days per week. The majority of the weekend activity (80-90%) will be directed free skiing, fundamental drills, and participation in 2 fun races during the season. U12's (10-11 years old) will run a similar plan with slightly more emphasis on course training and race starts at the higher levels as well as more complex fundamental drills. Mastery of individual drills is key at this age. Includes fall dryland training. Emphasis on fun, play, basic agility, balance and coordination. Incorporation of activities that develop explosiveness and general endurance. At this age, athletes are encouraged to do "lots of what they like to do" for activities. U12 age athletes will continue to work on aerobic capacity and incorporate own body weight and body awareness training. U10/U12 athletes are in the adventure stage and should learn how to ski all terrain. Guided free skiing and drills are an integral part of athlete development. When on snow, these athletes should be skiing and getting in lots of mileage. These athletes will learn to apply fundamental skills to achieve consistent and symmetrical parallel turns with rhythm and timing. Important skills to master are carving, linked carve turns, upper and lower body separation for angulation, and proper pole plant. U12's that are ready will be introduced to gate blocking, speed elements, course inspection, anticipation of terrain, line, and turn shape. A major objective is to free ski all terrain competently, with an emphasis on balance and carving. Teamwork and Sportsmanship is very important to instill at this time. Also important is the promotion of a balanced lifestyle that encourages healthy habits and promotes success in sport and life. Focus is on the process and not results. Positive parental support and family involvement in the foundation is essential. Older athletes can start to use imagery and visualizing good technique as an additional training tool. Local competitions. Innovative and FUN-focused inter-club competitions. Racing at the state/divisional YSL level.